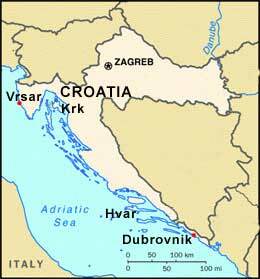 Outside the tourist resort Jelsa on island Hvar you find a small town named Vrboska. From there it is about two km:s to autocamp "Nudist". When you´re coming to Vrboska there are signs showing you the way. 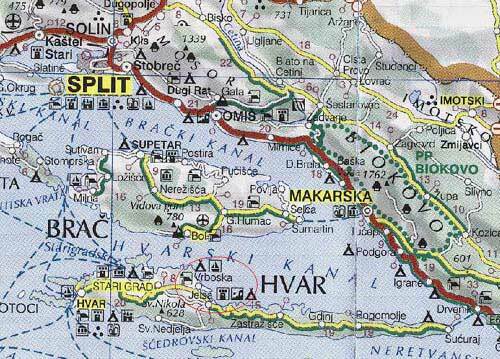 You can reach Hvar with car ferry from Split to Stari Grad or from Drvenik to Sucuraj. It is a small camping with a very cozy atmosphere. They´ve got a small restaurant and a "supermarket". Both run by the same very friendly family. It is clean and very well kept. Most places are in the shade of pine trees. The guests are mostly families with children. Everybody seems to know eachother. And if you don´t, you will soon do. 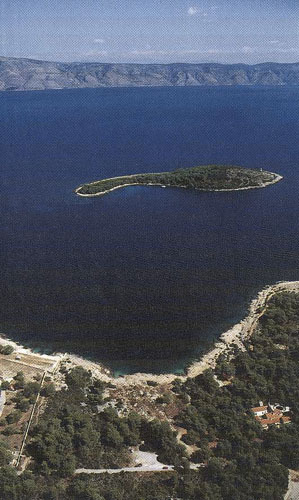 Outside the camping is the naturist island Zecevo (photo on the left). In the background is the island Brac and the town Bol. This is a true paradise for the children. No currents and no sea urchins. The kids can play all day in the clear water without any danger. Except maybe for the strong sun. Vrboska is a small town with some small restaurants, coffeebars, supermarket and a marina. There are some hotels just outside the camping. Jelsa is a famous tourist resort with a number of hotels and restaurants. Here is also a great supermarket if there is anything you miss at the camping. But you´ve got most what you need for a good holiday there.